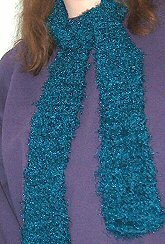 This fashionable scarf can be crocheted in less than 2 hours and uses 2 skeins of Patons soft and silky "Allure" yarn. Treat yourself to crocheting with the incredible feel of such a soft yarn, that doesn't shed! GAUGE: 5 sc and 4 rows = 2"
Model made using 2 skeins "Turquoise"
With N hook and yarn, ch 8. ROWS 2-110 (or stop at desired length): ch 1, turn, sc in each sc across. Finish off. TIPS: Since it is hard to see the actual stitches, use your fingers, instead, to "feel" where to put your crochet hook for each stitch.